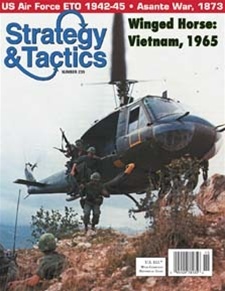 Winged Horse: Campaigns in Vietnam, 1965-66, is a simulation of the critical fighting that marked the first months after massive conventional US intervention into the Second Indochina War. This is a two player wargame of intermediate complexity designed by Joseph Miranda. One player controls the Communists, the other the Free World Forces. Each game turn equals one week, and each hexagon represents 25 miles. The units of maneuver for both sides range from battalions up through regiments, brigades and full divisions. The game includes one full-size (34x22") large-hex map and 280 half-inch, NATO-style, counters. All of South Vietnam, plus the border regions of Cambodia, Laos and North Vietnam are on the map, and the orders of battle include all the units of both sides that participated historically. There are two scenarios: one short, with only five game turns in the autumn of 1965, and the other long, covering the entire period of the early American war with a full 20 game turns. The rules contain approximately 16,000 words, which works out to two experienced players being able to get through the campaign game in one long session of about six to eight hours. The period under consideration was one of intense conventional warfare, as guerrilla and counter-insurgency operations temporarily moved into the background. Both sides rushed to plot major offensive operations because their high commands sensed there was the possibility to decide the entire war. For their part, the North Vietnamese sought to test the mettle of the arriving Americans, to see if a knockout blow could be struck against the new enemy. On the other side, the American high command planned to use its army's premier division, the newly "airmobile" 1st Cavalry, to carry the war into the enemy's infiltration routes and supply centers. The resultant clashes in the A-Shau and Ia Drang valleys, and elsewhere across the region, have become legendary.